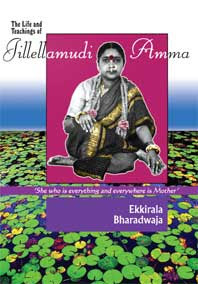 When he published this book in 1967, author Ekkirala Bharadwaja was the first to describe Anasuya Devi, popularly known as Jillellamudi Amma, and her ashram, recording her sayings and the happenings surrounding her up to the late 1960s. This first-person, present-tense account gives a vivid picture of what it was like to be graced with her presence. "If Knowledge is Brahman, why not Ignorance" "Where is the question of a good way to Atman when everything you see is that?" "Vedanta is that which is not understood either by the one that expounds it or the one that listens to it." After Amma laid aside her physical form on June 12, 1985, a life-size image of her was installed in 1987 at the temple in her ashram. Jillellamudi has become a pilgrimage centre where the continuous chanting of Amma's namam, "Jaya ho Mata Sree Anasuya Raja Rajeswari Sree Pararpari," is done. Amma stated, "Even without the body, my work continues." Today, many people confirm this. ACHARYA EKKIRALA BHARADWAJA did his M.A. (English) at Andhra University in 1959, and worked as Lecturer in English in several colleges in Andhra Pradesh from the early 1960s till he quit in the mid-seventies to pursue a spiritual path of life. He spent a number of years in Jillellamudi, observing and analyzing Amma's philosophy at close quarters. He authored many books in English and Telugu on Amma, Shirdi Sai Baba, and other saints. He was also a former editor of Matrusri, the monthly jounal in English published at Jillellamudi. can you send the info ? your phone numbers are also not working !